Well…it’s that time of year. The big one. The Bathurst 1000. Two years ago I got so close. This year will prove a more challenging chase. However I do have a gun co-driver, with Dean Canto once again partnering me in The Bottle-O Racing Falcon. Deano is a brilliant driver and together we make a great team. Sandown proved we are on the right track. Despite the pit lane penalty, we were quicker than we have been all year. On behalf of all my sponsors, and the team at FPR, I hope we can bring the Peter Brock Trophy home. 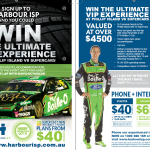 NEW SPONSORSHIP – TSW Wheels Harbour ISP’s New Promo!